(Photo: REUTERS / UNHCR / Jason Tanner / Handout)UNHCR Special Envoy Angelina Jolie meets Syrian refugees in the Bekaa Valley, Lebanon in September in this UNHCR handout photo. GENEVA - The U.N. Refugee Agency's latest Global Trends Report has revealed that there are now an unprecedented 51.2 million refugees, internally displaced people and asylum-seekers worldwide. The situation will not get any better until the conflicts around the world are resolved, U.N. officials said after revealing the updated statistics on World Refugee Day, June 20. The world's displaced exceeds 50 million people for the first time since the Second World War, said the United Nations agency in a statement. 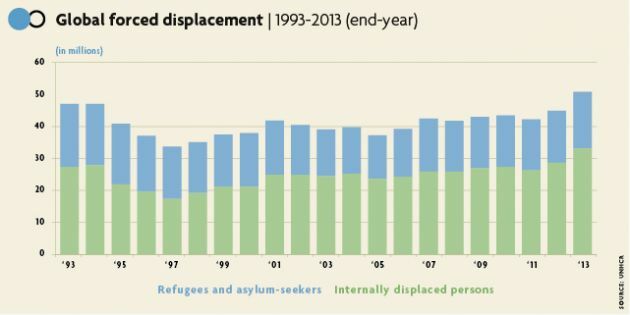 This massive increase was driven mainly by the war in Syria, which at the end of 2013 had forced 2.5 million people into becoming refugees and made 6.5 million internally displaced. The U.N. agency said major new displacements were also seen in Africa – notably in Central African Republic and South Sudan. "We are seeing here the immense costs of not ending wars, of failing to resolve or prevent conflict," said UN High Commissioner for Refugees António Guterres. "Peace is today dangerously in deficit. Humanitarians can help as a palliative, but political solutions are vitally needed. Without this, the alarming levels of conflict and the mass suffering that is reflected in these figures will continue. Pope Francis appealed to institutions to offer concrete help to the hundreds of thousands of refugees who continue to flee conflict and persecution in their homelands. "This staggering surge in refugee numbers shows that the world is failing to meet that responsibility. "This is an unjust and unsustainable situation. The only answer is to devote greater efforts and resources to addressing conflict worldwide - there are no humanitarian solutions to political problems," said Francis. "Millions of refugee families from different nations and of every religious faith live through dramatic stories and carry deep wounds that will be hard to heal," he said. The UN refugee agency's Special Envoy Angelina Jolie called for urgent action to end the vicious cycle of violence and displacement. "Preventing armed conflict should be a collective responsibility of the international community," Jolie said in Ban Mai Nai Soi camp in Mae Hong Son Province, Thailand on Friday. "This is an unjust and unsustainable situation. The only answer is to devote greater efforts and resources to addressing conflict worldwide - there are no humanitarian solutions to political problems." Overall, the biggest refugee populations under UNHCR care and by source country are Afghans, Syrians and Somalis. Together they account for more than half of the global refugee total. Pakistan, Iran and Lebanon hosted more refugees than other countries. Conflicts are becoming more complex said Rev. Eberhard Hitzler, the head of the Lutheran World Federation's Department of World Service, which is involved in running the world's biggest refugee camp in Dadaab, in Kenya near the Somali border. He urged governments to intervene in preventing and ending conflict, and appealed "to their generosity in granting asylum and resettlement, and in providing relocation schemes in various countries hosting displaced people."